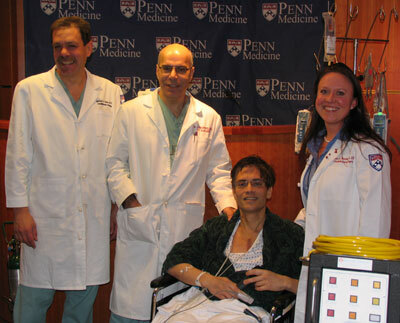 First Temporary Total Artificial Heart in Northeast U.S.
A 46-year-old former fitness instructor, suffering from biventricular end-stage heart failure and in irreversible cardiogenic shock, has become the first to receive a new temporary Total Artificial Heart in the Northeast U.S. by cardiac surgeons at the University of Pennsylvania Health System. This lifesaving technology is used as a “bridge to transplant” for patients who are waiting for a donor human heart, who have both sides of their heart failing, do not respond to other treatments and are at imminent risk of death. Research has shown that patients receiving the device, called the temporary Total Artificial Heart (TAH-t) and manufactured by CardioWest T (SynCardia Systems, Inc.), have almost twice the survival rate versus patients who received standard ventricular assist devices. The TAH-t completely replaced his damaged heart, as opposed to just assisting it, while he waits for a donor heart to become available for transplant. Prior to the surgery, Mr. Onufer’s heart could no longer pump enough blood to sustain his body, damaging his vital organs. “The TAH-t pumps up to 9.5 liters of blood per minute through both ventricles—making it the highest cardiac output of all mechanical circulatory support devices. This is truly lifesaving technology, implanted to do the work of a failing human heart until another one becomes available,” Dr. Acker concluded. Penn joins a short, prestigious list of institutions worldwide—becoming the first hospital in the region, 8th in the country, and 15th in the world—to complete TAH-t certification by performing a first proctored implant. Proceeds of more than $700,000 from The 2006 Philadelphia Antiques Show went to fund new technologies, including total artificial heart pumps, supporting consoles and monitoring equipment in the Heart Transplantation and Mechanical Assist Program in the Division of Cardiac Surgery. Dr. Rohinton Morris and Dr. Michael Acker have no financial interest in CardioWest or SynCardia Systems, Inc.